A husband in disguise and a wife who is tempted. The portrait tells the story. Jarett Orr, Joseph Beutel and Jenna Siladie, a deliciously absurd trio. Give the devil his due. 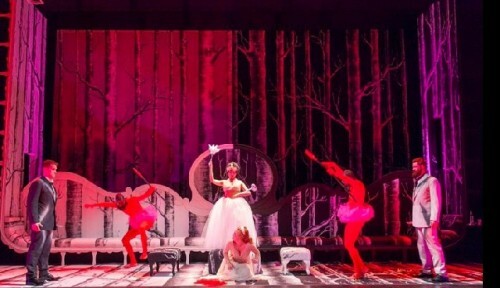 At the dramatic crescendo of each opera, the sets are bathed in red light: hell in one case, and war in another. Jenna Siladie only cheats in her dreams, but what a dream as directed by James Marvel. Who is Who is Whose. Often Asked. Of course in a absurd opera, the Alexander twice of the title if actually thrice. Jarrett Ott and Jopseh Beutel make three, not two or four. And so on. Quartet on a Bridge. Between two camps, enemies, four people try to get home, avoid being shot and solve their romantic/marital problems at the same time. 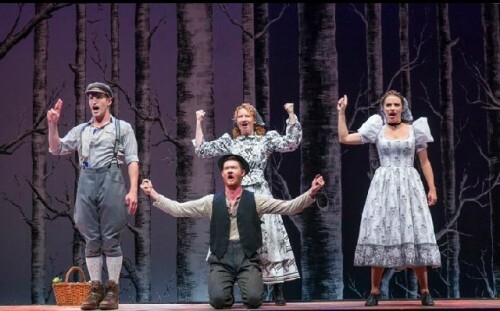 Jason Slayden, Jarrett Ott, Jenna Siladie and Abigail Fischer shine. No safe passage. You have safe passage, you give it up, you can't show it. You can't go home again. A lovers' dilemma. Presented by Gotham Chamber Opera in collaboration with the Gerald Lynch Theatre John Jay College. 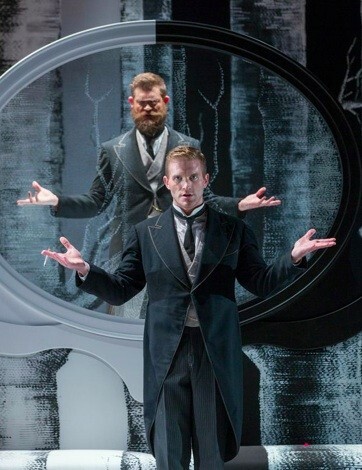 Gotham Chamber Opera was launched over a decade ago by the brilliant conductor Neal Goren. Its first program was a double bill of Blhuslav Martinu’s single act operas. This season Goren is teasing us with Martinu again. Goren captures his spirit: Martinu was born in a bell tower in Czechosvakia where his father was a campanologist. His work rings out, clear, light and charming. Gotham, with Goren at the helm, always gives us sophisticated entertainment accompanied by good music. Alexandre Bis and Comedy on the Bridge are no exception. 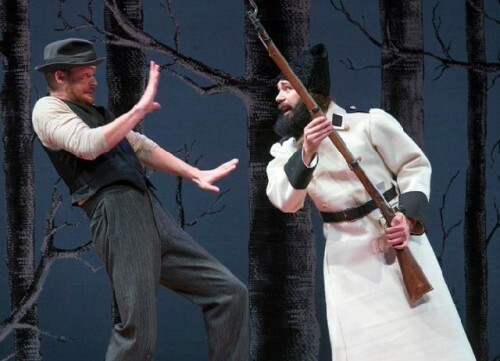 The plots are complicated but made perfectly clear in exaggerated gestures, dance-like movements and telling lyrics. James Marvel directed. Setting the characters in an absurdist domestic drama where a faithful woman is challenged to cheat on her husband by him in disguise and plays along to tease him, her dreams destroy her fidelity in Alexandre Bis. Jenna Siladie was a delightful Armande, singing in full-throated bubbles of sound. Jarrett Ott was her husband, husband and husband, singing in a strong, rich baritone. Jason Slaydon was both Oscar the athlete and a confused intellectual who seemed to have a deer for a partner in the second piece, Comedy on the Bridge. Cassandra Zoe Velasco is a maid with a mezzo, dusting and dazzling at the same time. Both sets had tall birches as background. Birches are common in Czechoslovakia and a famous story about the Lady of the Birches comes to life as the maid dances in Alexandre Bis: pirouetting and curtseying, skipping and swooping, whirling and laughing, skimming over the ground as lightly as the wind. Velasco lept to perfection. The sets are bathed in red light at the emotional peak of each piece. Both set designer and lighting designer have taken advantage of every opportunity to capture Martinu’s light and treacherous spirit on stage. Director Marvel captures the absurdist spirit of both pieces. Pushing the audience away with exaggerated gesture, freeze motion and posture, and yet engaging through the music and setups that tickle the fancy. The Comedy on the Bridge was first performed in 1935 and is sobering in retrospect. Who can forget the Poles rushing away from Russia at one end of a bridge and from Germany at the other. In Comedy on the Bridge, the dark underbelly is suggested at first by the presentation of papers that will allow the actors to pass over the bridge to home. The demand by the guard that the actors turn the papers over and then by the second guard that they can’t go home without presenting them having given the papers away is a horrifying absurdity. Goren conducted with brisk fervor and allowed the singers space to enjoy their lyrics and dance as well. It was a special evening with the Gotham. One we have come to expect from this first rate company. It is now deservedly at the top of the New York opera world after the demise of New York City Opera.